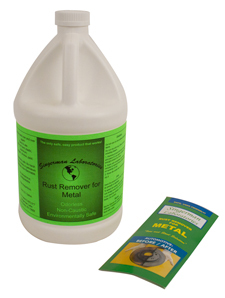 Singerman Laboratories Rust Remover easily removes tarnish and rust from iron and steel surfaces without abrasives or harming the metal surface. It will not harm plastic, paint, glass, aluminum, brass or nickel. Simply soak the rusted part and wipe off the rust. The process takes from 15 minutes to several hours, depending on the depth of the rust. After the rust is removed, rinse with water and dry, then treat with rust preventative. It can be used over and over until its strength is depleted. It is biodegradable, and environmentally friendly. Add $5.00 to normal shipping for 1 Gallon size.